There are many blogs that examine passages in Scripture that have what might be called a “folk theology” interpretation. These posts then try to set the record straight explaining what is a more probable interpretation. Some examples are Jeremiah 29:11, Matthew 18:20, 2 Tim 2:13, and the notion “all sins are equal in God’s eyes” or “one little lie will send you to Hell”. A passage that is not considered very controversial today or likely to get a closer look is the description of the Antioch Incident. But for the early church the event was pondered over and hotly debated. This event is recounted in the letter to the Galatians (2:11-14) and went something like this: Peter is visiting Antioch, perhaps to see first-hand how the gospel is spreading to the Gentiles (Acts 11:19-26). While he is there, Peter sits down to some bacon, lettuce, tomato sandwiches with some Gentile believers. While they are enjoying their meal some Jewish believers sent by James arrive in Antioch. Peter sees them, excuses himself from the table, and leaves the room. Returning with a kosher fish sandwich, he joins the new group of Jewish believers and enjoys catching up on the latest Jerusalem news. Soon the other Jewish believers are getting up from the Gentile table – even Barnabas – and sit down with Peter and the new arrivals. The Gentiles are wondering what is going on and whether they must follow the Mosaic Law too. Overhearing this Paul, who has been eating alone in the corner, stands up marches across the room and has some words with Peter. He calls him out for his hypocritical behavior, which is encouraging the Gentiles to observe the Law and distorts the gospel. We may stop for a moment and wonder why Paul chose to include this event as part of his defense of the Gospel? Or why Peter was afraid of the “circumcision party”? We are prudent to walk away from the event humble and alert to how our actions can impact the gospel since ‘even Barnabas’ was compelled to follow actions that contradicted the truth of the gospel. But what was it that sparked debate in the early church? 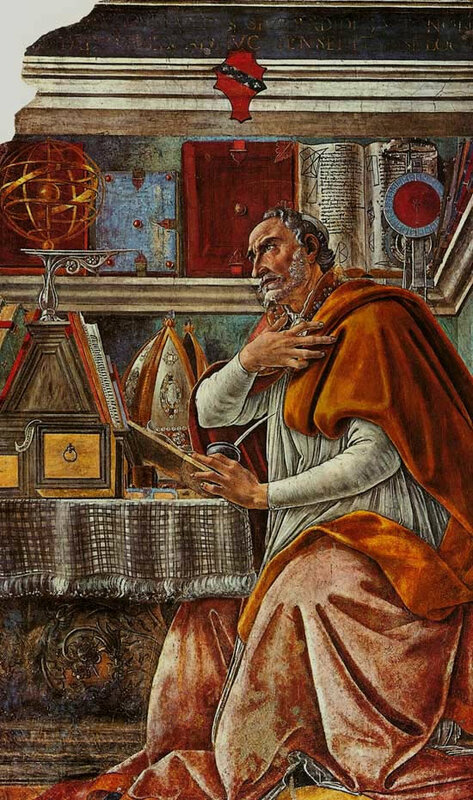 In this post we will look at how Jerome and Augustine wrestled with this passage as if they were writing and commenting in the blog-o-sphere. The source material will be several letters that were exchanged between these two theologians who have left a dramatic impact on Christianity. What are we to make of this strange account given to us by Paul in his letter to the Galatians? Porphyry, that noted philosopher and logician of old, does not consider Christians worthy of much attention. He has written against us calling us irrational and inconsistent. As an example he points out Paul as having wrongly rebuked Peter in Antioch. His claim is that Paul should not have corrected Peter, in front of a great many people no less, for engaging in the same behavior that he was in the habit of doing himself. What was this activity that Peter and Paul are both guilty of committing? Both were found observing Jewish precepts in order to win over Jewish people to Christ. Instead of remaining silent, Paul chose to humiliate Peter because he was envious of his position among those who are called Christians. This philosopher has long been refuted by many, including the world renowned and widely published theologian, Origen. Who, if I may say so, was the mentor to my own teacher Didymus. This most distinguished teacher clearly shows the mistakes that are made in the conclusions drawn by Porphyry. Porphyry rightly states that Paul adopted the practice that he accuses Peter of committing, becoming a Jew to the Jews so that he might win some (1 Cor 9:20). Therefore it can be concluded that Paul approved of Peter’s actions because he often imitated them. But it must be noted that Peter and Paul were pretending to follow the Mosaic Law and did not do it out of sincerity as if they were actually doing them. For Peter and Paul both knew that the Mosaic Law was not in force now that the gospel was given. They only acted the part so that they might not offend the Jewish believers who were weaker in faith and had not understood that the Mosaic Law was obsolete and no longer to be followed. We must remember that this transition from Law to grace was still very new and was becoming accepted only with great difficulty. Hence neither Peter nor Paul sinned in regards to acting like Jews so that they might win them over. Origen reminds us that things are not always as they seem. Paul did not foolishly choose to rebuke Peter for actions he actually condoned and practiced. Peter was guarding the weaker Jewish believers and Paul was guarding the weaker Gentile believers, so they chose to stage a rebuke of Peter with the purpose of reminding everyone that the way of salvation was not by the “works of the law” but through faith in Christ. As for the reader, it must be left for you to decide if this interpretation is correct. However, if one chooses to reject this view then he must show how Paul could have rightly rebuked Peter for doing those actions which he used throughout his own ministry. Jerome, big fan of all your work. You are very diligent in your studies of the Scriptures and I always am eager to read your latest thoughts and insights. I regret that we can not engage in discussion sitting down together as friends. Anyone who reads your works will be mightily blessed. I, however, find your latest entry to be indefensible. The very authority of Scripture is at stake if one is to adopt the view you propose. Can we accept that the authors of Scripture intended to write deceptive statements in the writings given to us for wisdom and edification? For if Peter was acting correctly when he chose to leave the table of the Gentiles and to sit with the Jews, then what Paul wrote in his letter to the Galatians is false. Paul very clearly and plainly states for all to read that Peter was in the wrong and acted in a manner that contradicts the gospel (Gal 2:11,14). Now, if Paul wrote these statements which are not true why did he give no indication that they should not to be taken as fact? Instead, he wrote clearly that “in these writings I do not lie” (Gal 1:20). If Paul claims he did not lie then why should we assume that his statements are false? If I adopt your opinion then how can I have any confidence in even a single sentence in the Scriptures. Only disaster can come from adopting your view as I hope you can now see. I must remain firm in this opinion unless I am refuted as to how the Scriptures can both contain false statements and be held with the highest authority. You pour out many kind words before you censure and publicly correct an old man, who finds joy in writing in the solitude that my retirement affords me. I am worn out from the race I have run and the battles I have fought, so I will skip with these pleasantries and get to the heart of the matter. Were you to attack me alone for teaching falsehood that would be no small matter. But, in your rebuke you censure not my opinions, though I do hold to what I wrote, but the opinions of many illustrious men who exceed me in wisdom and spiritual insight. For many hold to this view first put forth by Origen, including my very own mentor Didymus the blind. Others who hold to this view, whom you have undertaken to criticize are John who governs over the church of Constantinople, along with the bishop of Laodicea, Alexander, Eusebius of Emesa, and Theodorus of Heraclea. Does anyone hold your view? 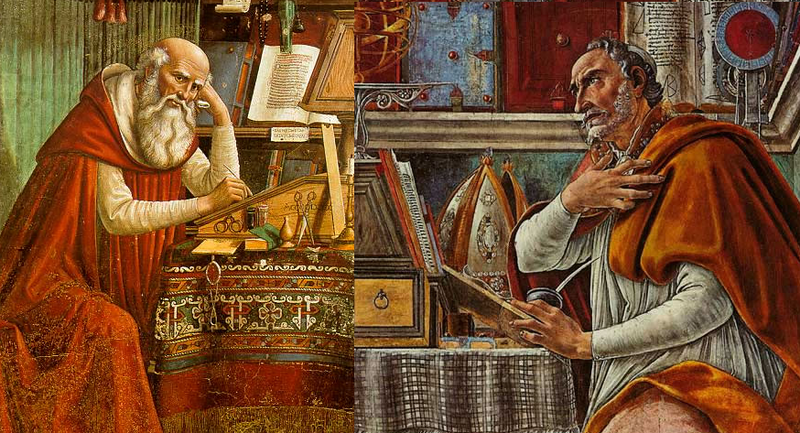 This entry was posted in Church History, Theology and tagged Augustine, authority of scripture, Galatians, Jerome, Origen by MikeB (@AnAgileJedi). Bookmark the permalink. I love it! Also, I’m wondering if you meant to connect to the post I did on Gal 5:1 instead of the intro. I did intend to link to the introduction to the series, but in hindsight the Galatians 5 post would have been a better choice given the series on Galatians. BTW: that Voddie Baucham video you posted for Jeremiah 29:11 is so good. It amazes me how many use that verse so badly.